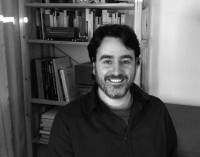 Joan Calsina Forrellad (Sabadell, 1983) did his undergraduate work in Humanities and his doctorate in Literary Theory and Comparative Literature. He also has a master’s in the Middle Ages and a Master’s in Literary Creation. He has worked as a copyeditor, editor, and translator as well as a teacher of music. He is the author of numerous articles about medieval history and poetic creation. He has published the poetry book Entre tu i jo, nosaltres (Between You and Me, Us), winner of the 23rd Miquel Martí i Pol Poetry Prize. The City of God is his first prose fiction work.